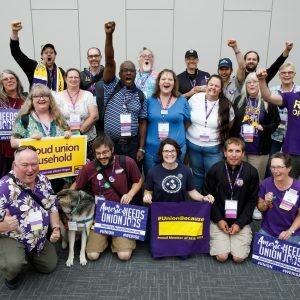 I am a direct support professional for Alvord-Taylor, an agency for young adults with developmental disabilities in Eugene, and I am an SEIU Local 503 member. I make about $10.50 per hour helping people with disabilities get through their day in the healthiest way possible. I also spend much of my day thinking about how I am going to pay my rent, feed myself and make my student loan payments. The cost of living in Eugene has gone up very quickly, and my wages simply aren’t enough to cover my basic needs. Part of Alvord-Taylor’s mission is to provide the highest quality of life for their clients as possible. However, at my wage, my co-workers and I are not afforded the same quality of life that we are expected to provide. To be honest, it’s often difficult to stay positive. Today, however, I’m feeling optimistic. Governor Kate Brown signed legislation this morning raising Oregon’s minimum wage. Her signature is a step forward for our state, and I am very proud that our legislators and our governor are leading the nation on this important issue. Click here to read more about the new law. I am also aware that we have a lot more to do build an economy that works for every Oregonian. Today’s victory shows that when we stick together, we can make real gains for our families and our communities. But Governor Brown’s signature is just the beginning. 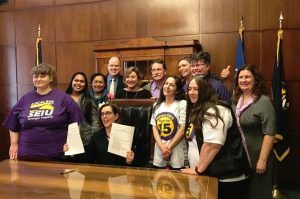 I would encourage everyone reading this to help us push for laws that improve the lives of working people in Oregon and to help us elect leaders that have our backs. I look forward to working with you as we continue building a brighter future for all Oregonians. 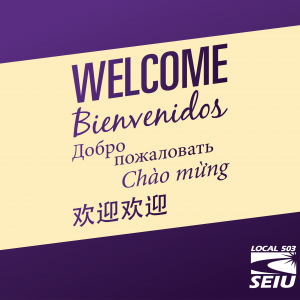 To make a voluntary contribution to CAPE, SEIU Local 503’s political action committee, click here. 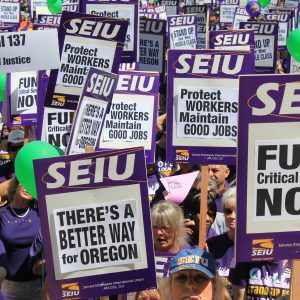 Join the more than 10,000 SEIU 503 members in Oregon who, through their contributions to CAPE, are winning victory after victory for working families.